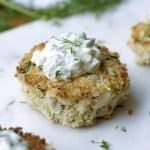 Crab Cake with Homemade Tartar Sauce seems like a fancy dinner recipe, but it actually an easy recipe. I love these cakes because they are light and buttery. They make a great holiday recipe. In a small bowl mix together all of the tartar sauce ingredients (red onion, green onion, pickle, capers, parsley, pickle juice, and mayo). Refrigerate the tartar sauce until needed. Prep the crab meat by picking out any leftover crab shells. In a large bowl mix together all of the crab cake ingredients (crab meat, Panko, onion, parsley, mayo, Old Bay, and lemon). Mix until just combined, then form into cakes using a 1/2 cup measuring spoon. Place the cakes in the refrigerator to chill for at least 30 minutes before frying. This will help the cakes stay together. Once the cakes are finished chilling, heat up a large skillet over medium high and add 2 Tablespoons of olive oil. Pour some Panko bread crumbs on a plate. Coat each cake with a layer of bread crumb and place them carefully into the hot skillet. Fry on each side for 3-5 minutes, or until browned. Serve with homemade tartar sauce.